Here is Brienne settling in to her new home with us. She is with her best mate Scooby ! Brienne thinks Scooby is a cushion ! 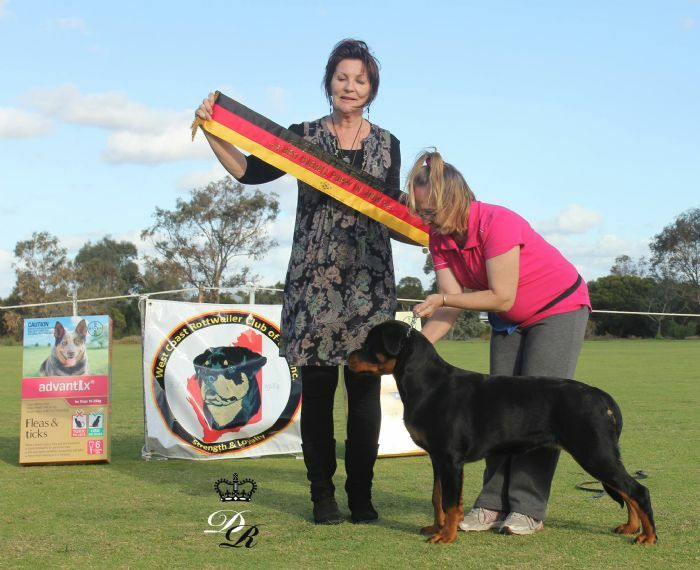 On the 30th August 2015 at her first Rottweiler Speciality Show - winning Best Baby in Show and Best Over All Puppy in Show in 2015, Judge : Mrs Olga Grinn (Russia) Graded VP1 - Sorry no photo's were taken . Here is Brienne in the All Breeds Show ring. Brienne is Celebrating winning Best Minor in Group at an All Breeds Show ! Here is Brie winning another Class in Group at the All Breeds Show. Brienne won a few Class in Groups, as well as winning a Runner up in Group and Best Open in Group ,Judge Mrs R Oma (WA) gaining her last points to become an Australian Champion. Here is Brienne, when she is not in the Show Ring ! She just loves the pool !!!! Brienne is now 3 and half years old and is having her second litter under our Prefix Jahwohl for the first time and we are very excited. Below two pics of Brie on the table, for her first ultra sound, to confirm pregnancy. Please join us in her Pregnancy Journey.